We are a husband and wife cat-saving team, John and Cindy! We have three cats of our own (as represented in our logo) and have been involved with cat rescue since 2009. During that time we have probably fostered well over a hundred cats as they try and find their forever home. Cindy is also involved in a national deployment-rescue organization. She is deployed to help out in animal welfare situations caused by natural disasters, hoarding situations, and puppy-mills. Our love for cats started when adopting our first cat together, Kitten. She is a silver Egyptian Mau mix. After we had her for a few months, we did not want her to be lonely and decided to start fostering kittens with a local animal rescue. We soon realized Kitten would much prefer to be an only cat and was never very welcoming to the new house guests. A couple years into fostering we came across Nice Guy. He is a black DSH who came to the rescue in bad shape with a broken pelvis and a larger area of skin and hair rubbed raw. To this day he still has a rather large patch where he can no longer grow hair and the hair that did grow back grew back white. He had a very difficult time at adoptions even though he was such a sweet kitty at home. We also noticed how nice and loving he was with any new fosters. We decided he had found his forever home with us and could always be counted on to help with new fosters while everyone left Kitten to enjoy her days in her own cat-free corner. Sweet Pea is our tortoise shell feral. She was trapped by a local woman who had been feeding her and noticed she was pregnant. John and Cindy volunteered to foster her through her pregnancy and help adopt out her kittens into good loving homes. After her kittens were raised, Sweet Pea was spayed and ear tipped as she was a feral and was planned to be re-homed to a barn. However, we fell in love with her sweet nature and she was ours! We don't see her too much and she will never be a lap cat (still too much feral in her) but she is our Sweet Pea! 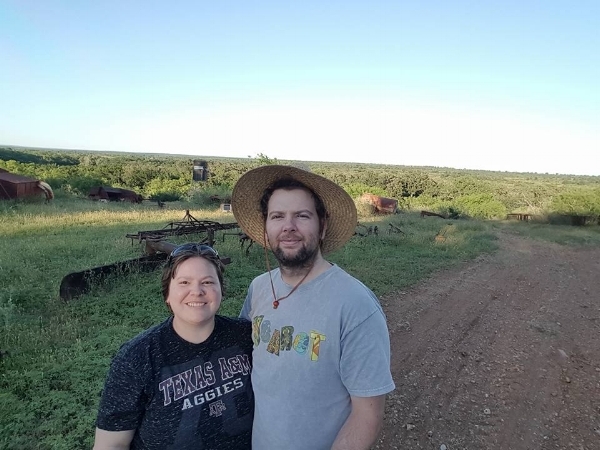 John and Cindy on the family farm! Merry Christmas from The Casual Cat Cafe!